Please be advised that the following actions are currently taking place and we need your help to tell the Navajo Nation Council Delegates to vote NO on NN Legislation 0373-13. Navajo Nation Council Delegate Leonard Tsosie of the Resources and Development Committee (RDC) is sponsoring Resolution 0373-13 which allows URI the Right-Of-Way over Tribal Trust land to start ISL URANIUM MINING at Churchrock, “Section 8″. Uranium Resources, Inc or “URI” is a Texas-based company, formerly known as: Hydro Resources Inc. or “HRI” which has contaminated ground water at its other ISL projects and will surely contaminate the groundwater of Eastern Navajo if this project commences. Many communities around Church Rock will be in danger if operations begin and so we need to get the word out. The RDC is accepting Publc Comments and has scheduled a Special Meeting with this as the main agenda item on Monday December 23, 2013 at 9 A.M. at Chilchinbeto Chapter, Chilchinbeto, AZ (south of Kayenta). This action by a few elected officials is UNACCEPTABLE!! This will no doubt endanger our community, our children, and the area we call home. Uranium is a poison and mining it is an improper and dangerous use of our water and natural resources!! Uranium should be left in the ground! We cannot regulate it and to think that we have power over nature is arrogant and dangerous. I am asking you to please Send Comments and join many other Dine’ people in saying NO AND TO STOP NEW URANIUM CONTAMINATION at the Special RDC meeting next Monday morning at Chilchinbeto Chapter. There are drafted Comments for you to use for reference. You can personalize the comments or just cut & paste and email ASAP! Your Chapter can also use these points to draft NEW Chapter Resolutions to Opposing Uranium Mining and Resolution 0373-13 too. Comments should be emailed to comments@navajo-nsn.gov by tomorrow, Saturday December 21 by 5 P.M. Mountain Time. Letters and written comments should be mailed to: Executive Director, Office of Legislative Services, PO Box 3390, Window Rock, AZ. 86515 postmarked by December 21, 2013. I ask that you all forward this to all your contacts so that they can also get the word out to STOP Delegate Tsosie’s resolution. Please stand with us in defending our homes and our health. Human life is priceless and we should speak up for our next generation who don’t have a voice now. The young children and generations to come will have to live with our choices today. The resolution violates the Diné Natural Resources Protection Act of 2005. In that law, the entire Navajo Nation Council prohibited uranium mining and processing on tribal land. The resolution would allow URI to mine uranium on reservation land in Churchrock. A single committee of the Council cannot overturn legislation passed by the entire Council. The resolution violates the Radioactive Substances Transportation Act of 2012, which was passed by the entire Navajo Nation Council. That law prohibits transportation of radioactive materials across tribal land, except in limited circumstances that must be approved by the Navajo Nation Environmental Protection Agency. The resolution violates the Navajo Nation Energy Policy of 2013, passed by the entire Navajo Nation Council. 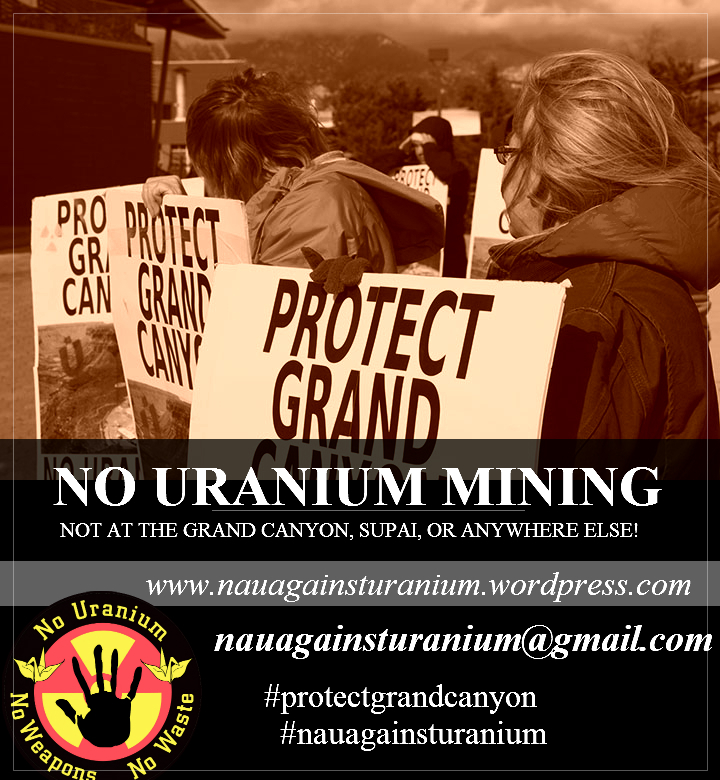 The resolution conflicts with the access agreement that the Navajo Nation has already negotiated with URI and that does not allow any new uranium mining. The people of the Navajo Nation have rejected uranium mining because it has never resulted in any meaningful economic development for the Diné – it has only resulted in radioactive air, polluted water, sickness and death. Download, print, and distribute on campus! Because at nuclear power plants, accidents happen. Palo Verde, a nuclear power plant that generates electricity near Phoenix, Az, recently has been testing it’s emergency sirens too. You know, just in case. Two of the three units at the country’s largest nuclear plant cut their power output Monday following unrelated mechanical problems. Unit 2 at the Palo Verde plant operated by Arizona Public Service shut down completely just before 6 p.m. According to a report filed with the Nuclear Regulatory Commission, the pressurized water reactor tripped automatically from full power. An initial investigation suggested the shutdown resulted from a tripped power supply circuit breaker for a reactor coolant pump. According to the report, operators noted that the 1A RCP was not running during the shutdown. At about the same time at unit 3, a control rod dropped unexpectedly when an associated circuit breaker tripped open, according to another NRC report. The other 88 control rods were unaffected, but operators began to power down the reactor as a precaution. Early Tuesday morning, with the unit at 48 percent power, workers cancelled the shutdown after replacing and testing a power switch for the dropped control rod and realigning it with the other control elements, according to the NRC. Neither incident posed a threat to public or worker safety. An alliance of corporations and conservative activists is mobilising to penalise homeowners who install their own solar panels – casting them as “freeriders” – in a sweeping new offensive against renewable energy, the Guardian has learned. Over the coming year, the American Legislative Exchange Council (Alec) will promote legislation with goals ranging from penalising individual homeowners and weakening state clean energy regulations, to blocking the Environmental Protection Agency, which is Barack Obama’s main channel for climate action. Details of Alec’s strategy to block clean energy development at every stage – from the individual rooftop to the White House – are revealed as the group gathers for its policy summit in Washington this week. About 800 state legislators and business leaders are due to attend the three-day event, which begins on Wednesday with appearances by the Wisconsin senator Ron Johnson and the Republican budget guru and fellow Wisconsinite Paul Ryan. Other Alec speakers will be a leading figure behind the recent government shutdown, US senator Ted Cruz of Texas, and the governors of Indiana and Wyoming, Mike Pence and Matt Mead. For 2014, Alec plans to promote a suite of model bills and resolutions aimed at blocking Barack Obama from cutting greenhouse gas emissions, and state governments from promoting the expansion of wind and solar power through regulations known as Renewable Portfolio Standards. “This is an issue we are going to be exploring,” Eick said. He said Alec wanted to lower the rate electricity companies pay homeowners for direct power generation – and maybe even charge homeowners for feeding power into the grid. Gabe Elsner, director of the Energy and Policy Institute, said the attack on small-scale solar was part of the larger Alec project to block clean energy. “They are trying to eliminate pro-solar policies in the states to protect utility industry profits,” he said. Until now, the biggest target in Alec’s sights were state Renewable Portfolio Standards, which require electricity companies to source a share of their power from wind, solar, biomass, or other clean energy. Such measures are seen as critical to reducing America’s use of coal and oil, and to the fight against climate change. RPS are now in force in 30 states. “Approximately 15 states across the country introduced legislation to reform, freeze or repeal their state’s renewable mandate,” the taskforce reported. That compares to model bills in just seven states in support of the hot-button issue of the Keystone XL pipeline, according to figures in the documents. “This legislative year has seen the most action on renewable mandates to date,” the documents said. Three of those states – North Carolina, Ohio, and Kansas – saw strong pushes by conservative groups to reverse clean energy regulations this year. None of those efforts passed, however, with signs of strong local support for wind farms and other clean energy projects that were seen as good for the economy – from Republicans as well as Democrats. By August, Alec evidently decided its hopes of winning outright repeal of RPS standards was overly ambitious. At its meeting in August, Alec put forward an initiative that would allow utility companies to import clean energy from other states – rather than invest in new, greener generation. An “explanatory note” prepared for the meeting admitted: “One model policy may be the right fit for one state but not work for another”. Elsner argued that after its bruising state battles in 2013, Alec was now focused on weakening – rather than seeking outright repeal – of the clean energy standards. “What we saw in 2013 was an attempt to repeal RPS laws, and when that failed … what we are seeing now is a strategy that appears to be pro- clean energy but would actually weaken those pro- clean energy laws by retreating to the lowest common denominator,” he said. The other key agenda item for Alec’s meeting this week is the EPA. The group is looking at two proposals to curb the agency’s powers – one to shut the EPA out of any meaningful oversight of fracking, and the other to block action on climate change. A model bill endorsed by the Alec board of directors last August would strip the EPA of power to shut down a frack site or oil industry facility. That would leave oversight of an industry that has to date fracked 2m wells in 20 states to a patchwork of local authorities that have vastly different standards of environmental protection. The model bill would explicitly bar the EPA from shutting down any oil or gas well or facility in any of them, limiting the agency’s capacity to enforce the clean water and clean air acts. “The legislature declares that the United States Environmental Protection Agency … lacks the authority to deny permits of operation to these oil and gas wells and facilities,” the bill reads. Eick said the bill was in keeping with the group’s broader philosophy of expanding power to the states. “A national regulatory agency might impose a cookie-cutter, one-size-fits-all regulation on states in many instances,” he said. The meeting will also focus on Obama’s plan, announced last June, to use the EPA to limit greenhouse gas emissions from future and existing power plants. “The EPA’s forthcoming regulation of greenhouse gas emissions and specifically carbon emissions from power plants will be of incredible interest to states and membership so we are going to be focusing on that. Absolutely,” Eick said. Power plants are the biggest source of greenhouse gas emissions, accounting for about 40% last year. The EPA last September proposed new standards for future power plants, and will tighten limits for existing power plants next June. The resolution on the EPA for Alec members’ consideration this week argues that requiring tougher standards from the next generation of power plants lead to spikes in electricity prices and would damage the economy. “Alec is very concerned about the potential economic impact of greenhouse gas regulation on electricity prices and the harm EPA regulations may have on the economic recovery,” the resolution reads. Environmental lawyers said the resolution amounted to a “new manifesto” against the EPA regulating carbon pollution. “They don’t want the EPA to regulate greenhouse gas emissions,” said Ann Weeks, legal director for the Clean Air Task Force. She disputed a number of claims within the Alec resolution – including the assertion that reducing carbon pollution would lead to an 80% rise in electricity prices. Economic analyses by the EPA and others have suggested those rises would be fairly limited. “They will probably tell you they don’t want the EPA to regulate anything so it is in their interest to turn what the EPA has proposed into something that is grotesque and unreasonable, which I don’t think is true,” Weeks said. WINDOW ROCK, Arizona — On December 2 through 4, 2013, the International Uranium Film Festival (IUFF) — the world’s only traveling festival devoted to the entire Nuclear Fuel Chain — will be held in the homeland of Diné communities sacrificed by the United States for production of nuclear weapons. This IUFF event is organized in conjunction with a community gathering of Diné organizations and residents with regional groups concerned about uranium’s effect on: human health and future, environment, economy, culture and water. The festival will include presentations, workshops, info tables, t-shirt printing and 21 films. The arrival of the IUFF is apt, coming at a time when the Navajo Nation’s leaders are making decisions regarding its new Uranium Commission, the 2013 Energy Policy and new multi-agency clean-up plans. Local uranium mining, processing, transport and changes in HRI/URI, Roca Honda mine and White Mesa mill are topics that will be highlighted by community experts during the week. The three-day event is free and open to the public for the purposes of “Art and Awareness,” community dialogue and decolonization of Western concepts about uranium. The films are documentaries, animations and shorts that explore not only the effects of radiation, but also the practices of the nuclear industry and world governments as well. For more inquiries, to support the event, please contact Leona Morgan (505-879-8547). The organizers wish to give a Special Thanks to all the sponsors, contributors and volunteers: Diné Bidziil, International Uranium Film Festival, Honor the Earth, Western Action Mining Network, Indigenous Environment Network, Multicultural Alliance for a Safe Environment, Seventh Generation Fund, Sierra Club Environmental Justice Program and the Front End Working Group, Southwest Indigenous Uranium Forum, and Heinrich Böll Stiftung North America. Sure, the mining industry raked in billions of dollars for the state, but what does “economic growth” mean? Not much in our society is more faithfully followed than economic growth. Its movements are constantly monitored, measured to the decimal place, deplored or praised, diagnosed as weak or judged healthy and vigorous. Newspapers, magazines, and cable channels report regularly on it. It is examined at all levels — global, national, and corporate. Indeed, one of the few things on which left, right, and center agree is that growth is good and more of it is needed. Growth doesn’t work. It doesn’t deliver the claimed social and economic benefits. Our measure of growth — gross domestic product or GDP — is fundamentally flawed. The focus on growing GDP deflects us away from growing the many things that do need to grow. Economic activity and its growth are the principal drivers of massive environmental decline. 1. Growth doesn’t work. It doesn’t deliver the claimed social and economic benefits. Since 1980, real GDP in the United States has grown about 130 percent, and you know what happened: wages stagnated, jobs fled our borders, life satisfaction flatlined, social capital eroded, poverty and inequality mounted, and the environment declined. Today, GDP has more than fully “recovered” from the Great Recession and now exceeds pre-recession levels, but unemployment is still about 7.5 percent with an almost equal number of Americans either underemployed or no longer in the work force for lack of opportunity. Desperately seeking more GDP growth is unlikely to yield better results, for reasons described subsequently. Also described are some better approaches. 2. Our measure of growth, GDP, is terribly flawed. GDP should stand for Grossly Distorted Picture. Still, it sits in regal enthronement. Never mind that GDP is simply a gross measure of all activity in the formal economy — good things and bad things, costs and benefits, mere market activity, money changing hands, busyness in the economy — for the bigger it gets, the greater the potential for both private profit and public revenue. Though it is still very much on the throne, GDP’s continued dominance is threatened today. Of all the transitions discussed in America the Possible, the transition from GDP to a fuller, more accurate depiction of where the nation is and is heading may be the closest to a tipping point that can hasten its completion. We can now envision a dashboard of indicators to supplement those that measure economic activity, unemployment, and inflation. That dashboard should include (1) measures of true economic progress that correct and adjust GDP so that we can gauge sustainable economic welfare in society, (2) indicators of objective social welfare such as the status of health, education, and economic security, (3) indexes of environmental conditions and trends, (4) indicators of political conditions and democracy, and (5) measures of subjective well-being such as life satisfaction, happiness, and trust. The first of these measures responds to society’s need for a monetized measure of sustainable economic welfare–an indicator that corrects the shortcomings of GDP as a measure of social well-being and that can be compared with the movements of GDP and GDP per capita on a regular, quarterly basis. The most important efforts to date have been those developing the Index of Sustainable Economic Welfare (ISEW) and its American offshoot, the Genuine Progress Indicator (GPI), now being developed in several states. The ISEW begins with national private consumption expenditures and then adjusts that for distributional inequalities. It then adds in nonmarket contributions to welfare, such as unpaid housework, and subtracts out defensive expenditures such as police protection and pollution control, and it also subtracts the depreciation of natural resources and environmental assets. 3. The focus on GDP growth deflects efforts from growing the many things that do need to grow. Of course, many things do indeed need to grow. We need to grow the number of good jobs and the incomes of poor and working Americans. We need growth in investment in public infrastructure and in environmental protection; growth in the deployment of climate-friendly and other green technologies; growth in the restoration of both ecosystems and local communities; growth in research and development; growth in security against the risks attendant to illness, old age, and disability; and growth in international assistance for sustainable, people-centered development for the world’s poor. These are among the many areas where public policy needs to ensure that growth occurs. Jobs and meaningful work top that list because unemployment is so devastating. America should be striving to add jobs twice as fast as we are, or more. But likely future rates of overall economic growth won’t get us near this goal. The availability of jobs, the well-being of people, and the health of communities should not be forced to await the day when GDP growth might somehow deliver them. It is time to shed the view that government provides mainly safety nets and occasional Keynesian stimuli. We must insist that government have an affirmative responsibility to ensure that those seeking decent-paying jobs find them. The surest, and also the most cost-effective, way to that end is direct government spending, investments, and incentives targeted at creating jobs in areas where there is high social benefit, such as modern infrastructure, child and elder care, renewable energy and energy efficiency, environmental and community restoration, local banking, and public works and childhood education. 4. The over-riding imperative to grow gives over-riding power to those, mainly the corporations, which have the capital and technology to deliver that growth, and, much the same thing, it undermines the case for a long list of public policies that would improve national well-being but are said to “slow growth” and to “hurt the economy.” Thomas Friedman says that economic globalization puts countries in a golden straightjacket — creating new wealth but constraining national policies. Far more encompassing is the straightjacket of the growth imperative. It is possible to identify a long list of public policies that would slow GDP growth, thus sparing the environment, while simultaneously improving social and individual well-being. Such policies include shorter workweeks and longer vacations; greater labor protections, including a “living” minimum wage, protection of labor’s right to organize, and generous parental leaves; guarantees to part-time workers; a new design for the twenty-first-century corporation, one that embraces rechartering, new ownership patterns, and stakeholder primacy rather than shareholder primacy; restrictions on advertising; incentives for local and locally owned production and consumption; strong social and environmental provisions in trade agreements; rigorous environmental, health, and consumer protection; greater economic equality with genuinely progressive taxation of the rich (including a progressive consumption tax) and greater income support for the poor; increased spending on neglected public services; and initiatives to address population growth at home and abroad. Taken together, these policies would undoubtedly slow GDP growth, but quality of life would improve, and that’s what matters. In this mix of policies, Juliet Schor and others have stressed the importance of work time reduction. For example, if productivity gains result in higher hourly wages (a big if in recent decades) and work time is reduced correspondingly, personal incomes and overall economic growth can stabilize while quality of life increases. She points out that workers in Europe put in about three hundred fewer hours each year than Americans. 5. Economic activity and its growth are the principal drivers of massive environmental decline. In a remarkable passage of his environmental history of the twentieth century, Something New Under the Sun, historian J. R. McNeill writes that the “growth fetish” solidified its hold on imaginations and institutions in the twentieth century: “Communism aspired to become the universal creed of the twentieth century, but a more flexible and seductive religion succeeded where communism failed: the quest for economic growth. Capitalists, nationalists — indeed almost everyone, communists included — worshiped at this same altar because economic growth disguised a multitude of sins. … Social, moral, and ecological ills were sustained in the interest of economic growth; indeed, adherents to the faith proposed that only more growth could resolve such ills. Economic growth became the indispensable ideology of the state nearly everywhere. The relationship between economic gains and environmental losses is a close one, as McNeill notes. The economy consumes natural resources (both renewable and nonrenewable resources), occupies the land, and releases pollutants. As the economy has grown, so have resource use and pollutants of great variety. As Paul Ekins says in Economic Growth and Environmental Sustainability, “the sacrifice of the environment to economic growth. . . has unquestionably been a feature of economic development at least since the birth of industrialism.” And so it remains. Among the myriad threats growth imposes on biodiversity and resources, the existential issue posed by climate disruption is particularly worrying. Many analysts have concluded that reducing greenhouse gas emissions at required rates is likely impossible in the context of even moderate economic growth. To reduce U.S. carbon emissions by 80% between now and 2050, the carbon intensity of production must decline by 7% every year, if the U.S. economy grows at 3% a year. That entails wringing carbon out of the economy at a phenomenal rate. If the United States were to do the right thing–reduce emissions by 90 percent in 35 years–the rate of carbon intensity reduction would have to be 9.5 percent. Clearly, a tradeoff between prioritizing growth and prioritizing climate protection is emerging. To conclude, we tend to see growth as an unalloyed good, but an expanding body of evidence is now telling us to think again. Daniel Bell wrote that economic growth is the world’s secular religion, but for much of the world it is a god that is failing — underperforming for most of the world’s people and, for those in affluent societies, now creating more problems than it is solving. The never-ending drive to grow the overall U.S. economy has led to a ruthless international search for energy and other resources, failed at generating needed jobs, led us to the brink of environmental calamity, and rests on a manufactured consumerism that does not meet the deepest human needs. Americans are substituting growth and ever-more consumption for doing the things that would truly make us and our country better off. There are limits of growth, and there are limits to growth. The limits of growth are hit long before the limits to growth. If economists are true to their trade, they will recognize that there are diminishing returns to growth. Most obviously, the value of income growth declines as one gets richer. An extra $1,000 of income means a lot more to someone making $15,000 a year than to someone making $150,000. Meanwhile, growth at some point also has increasing marginal costs. For example, workers have to put in too many hours, or the climate goes haywire. It follows that for the economy as a whole, we can reach a point where the extra costs of more growth exceed the extra benefits. One should stop growing at that point. Otherwise the country enters the realm of “uneconomic growth,” to use Herman Daly’s delightful phrase, where the costs of growth exceed the benefits it produces. Here in the United States, we’ve had uneconomic growth for quite a while. and unemployment declines due to work-sharing arrangements. The model succeeds in generating these results, however, only if no-growth is phased in over several decades, not imposed immediately. In his discussion of policies needed for the transition, Victor mentions caps on emissions, and resource-harvesting limits that take into account the environment’s assimilative capacity and resource regeneration rates, government social policies to eliminate poverty, reduced work time for employees, and other measures. One hears a lot about reviving the economy and getting it growing again. But shouldn’t we be striving to transform the economy and not merely revive it? The old economy simply hasn’t been delivering economically, socially or environmentally for decades. The roots of our environmental and social problems are systemic and require transformational change. Sustaining people, communities, and nature should be the core goals of economic activity, not hoped for byproducts of an economy based on market success, GDP growth, consumerism, and modest regulation. The new economy we should be striving to build is a post-growth economy that actually gives top priority to people, place and planet. That is the paradigm shift we need.